Hidden away in 20 acres of beautiful natural woodland, De Vere Cranage Estate is the ideal location for conferences, events, weddings, and exploring the surrounding countryside and attractions. Minutes away from junction 18 of the M6 motorway and within easy reach of Manchester Airport. Business and leisure travellers alike will enjoy a relaxing rural setting and a stylish hotel equipped with modern conveniences. From weddings and celebrations to conferences and training sessions, De Vere Cranage Estate offers exceptional event spaces easily tailored to any occasion. The nearest mainline railway stations are Crewe and Macclesfield, which are approximately 20 minutes by taxi from the hotel. The nearest local station is Holmes Chapel, just five minutes away and convenient when travelling to/from Manchester city centre. 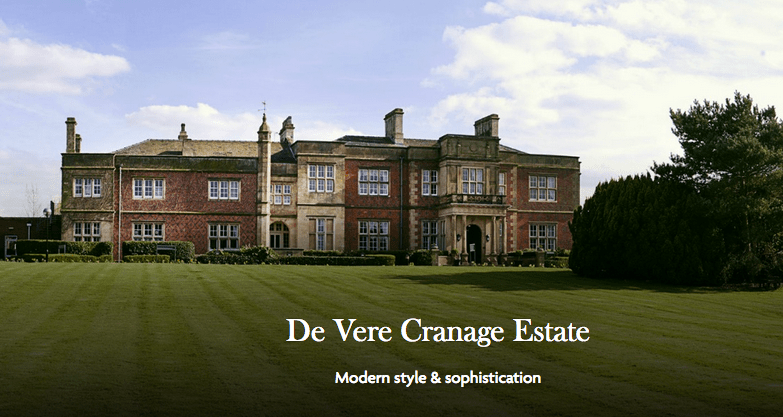 De Vere Cranage Estate is easily accessible from the M6 via the A50. Use the following navigation coordinates (53.211199, -2.375869) and postcode (CW4 8EW) to find the hotel. Parking is extensive and free for guests of the hotel, conference venue, and leisure club. Manchester Airport is just 18 miles—or approximately 25 to 30 minutes via car or taxi—from De Vere Cranage Estate. Ample parking is available on the hotel grounds.